A decorative and stylish cigarette. Strike a pose, it's Vogue! For any woman looking for a classy, elegant cigarette, Vogue cigarettes make a good choice. These cigarettes with their unique shape and style are known for their soft, smooth and pleasant taste. In addition, the tobacco blend found in Vogue cigarettes is of the highest quality. And now, any woman who purchases Vogue cigarettes is in for a surprise. Now these cigarettes can be purchased for their lowest price ever – at Duty Free Depot, an online shop for tobacco products. 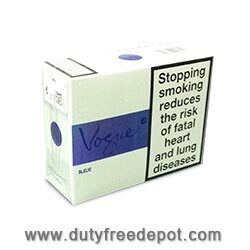 The shop offers a many types and flavors of Vogue cigarettes: Vogue Blue Super Slim, Vogue Lilas Super Slim, Vogue Menthol Super Slim, Vogue Arome and more. Besides Vogue cigarettes, at Duty Free Depot you can find many other types of cigarettes, as well as cigars and other tobacco products. In addition, the shop offers tobacco-related products such as lighters, spirits, e-cigarettes and various accessories. The prices at Duty Free Depot are the cheapest you'll find anywhere – perhaps the cheapest on the web. At Duty Free Depot, the more boxes, cartons and packets of the items you order, the less you will pay for each item. In addition, the shop often offers special deals and limited-time coupons, so checking the website regularly is a good idea. Low prices are great, but what other advantage does buying your cigarettes at Duty Free Depot have? Well, whether you live in the USA or abroad, the shop offers worldwide shipping – so take advantage of that and order large quantities. 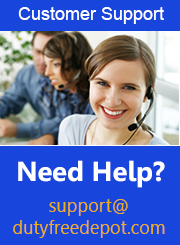 In addition, a great customer service will take care of all your questions and needs. Also, the service is highly professional and reliable – so you can be sure that whatever problem you have, it will be solved quickly and efficiently. Purchase your cigarettes at Duty Free Depot. It's worth it!